Static Trapeze is a stationary bar suspended from two ropes. It is an excellent foundation apparatus for developing aerial awareness and building confidence. In this class, you will learn a range of skills under, on and above the bar in the ropes, and how to connect these moves into sequences that build strength and stamina. Progress to more advanced balances, strength and flexibility moves, as well as momentum-based skills. 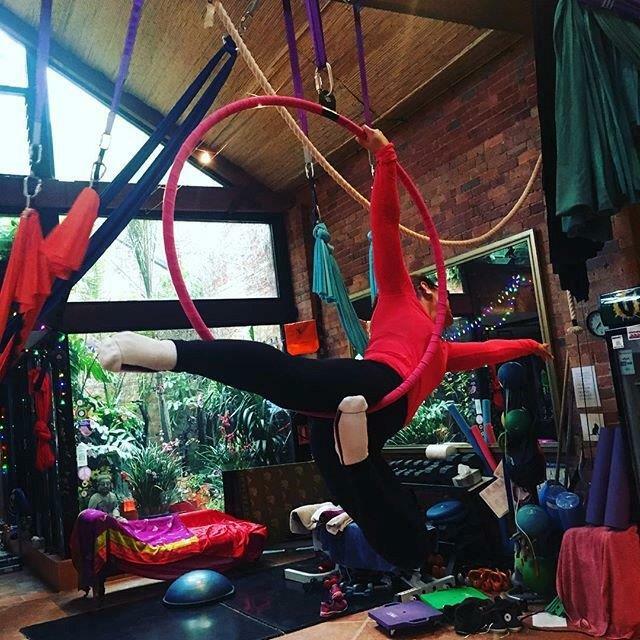 LYRA – (also known as Aerial Hoop and Cerceau) is a steel ring suspended from a single point which can be used either statically or with a spin. In this class, you will learn a range of skills under, on and above the hoop, and how to connect these moves into sequences. As confidence, strength and aerial awareness develop, learn different spinning techniques and progress to spinning skills sequences. One hour long, focused on learning new skills and/or reviewing and perfecting technique. (Beginner classes include instruction for proper floor warm-up. )All classes will conclude with body conditioning and/or stretch on the apparatus. Aerial classes have a maximum of 6 students to ensure sufficient time on the apparatus for each person. Private lessons and semi-private lessons are available upon request, for more individual attention. Before you purchase any classes please text 0412526383 as we have limited numbers in the class and it fills up fast. We will start with a one of casual, class try it out- $25.90 only 6 in a class so you get the attention you deserve. Then as soon as we have 4 people committed to a block of four we can lock, book, pay for the 4 weeks up front-same time and day each week. if you miss a class you cannot make it up. how ever you are welcome to gift it to a friend.